The Good: Packed with features, bullet-train handling, all-weather capability. The Bad: Spooky roar from the roof rack, poor gas mileage for its class. The Verdict: The Labrador retriever of small cars – does most things well and likes to get dirty while doing it. 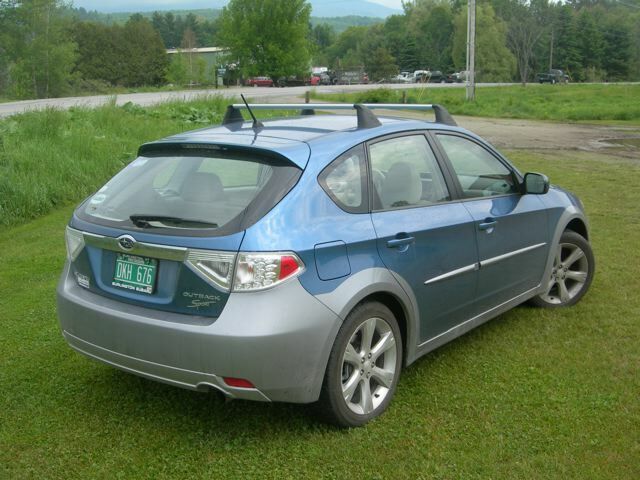 Throw a rock in a New England parking lot, and you’re likely to hit a Subaru. The Japanese brand has found a niche among flannel-clad Maine residents and maple syrup-chugging Vermonters for one main reason: it offers all-wheel-drive on every single car it sells. 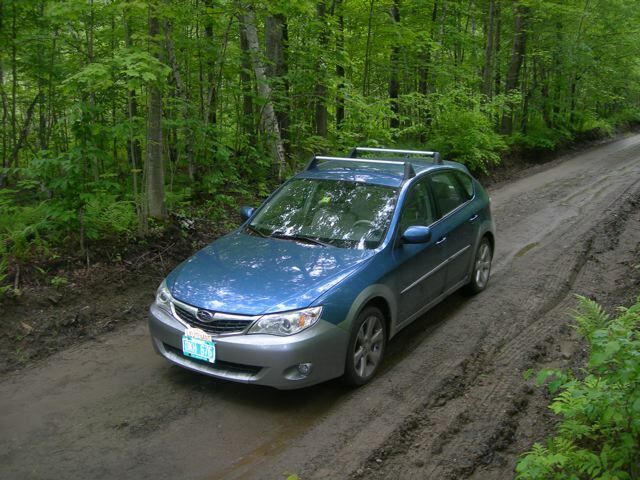 For environmentally-conscious New Englanders, Subarus are a perfect fit: all the traction of a sport-utility vehicle during the 359-day long winters, with the fuel economy of a regular car. Yet like any jack-of-all-trades, Subarus can’t compare with the specialists they copy; they’re no competition for true SUVs off-road, and aren’t able to match the mileage of most cars their size on the pavement. Even so, they prove themselves up for just about anything the harsh northern climate can throw at them. The Outback Sport I tested is a perfect example of the average Subaru. It comes with only one engine, a 2.5 liter, 170-horsepower four-cylinder ‘boxer’ engine – the boxer name referring to the horizontal layout of the engine’s pistons, which look like they punch each other when the engine is running. As mentioned earlier, fuel economy isn’t particularly good for a compact car – the EPA rates it at 20 miles per gallon city and 27 highway. 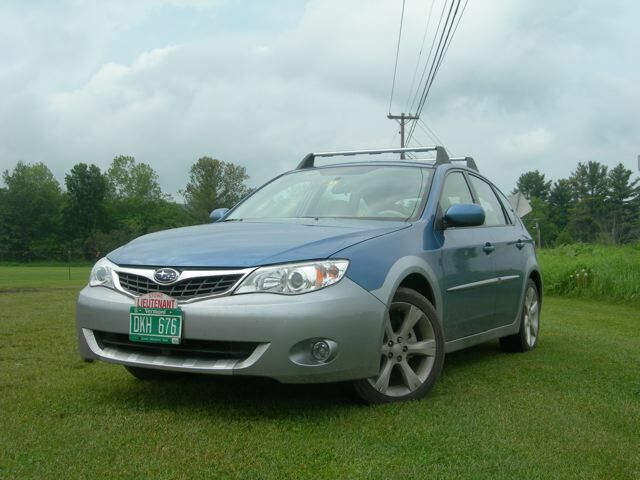 My tester got 26 mpg in mixed driving, the majority of which was a 225-mile drive from Boston to central Vermont. From behind the wheel, the Outback Sport never feels particularly lithe, probably a side effect of the added mass of its all-wheel-drive system. The steering is heavy and not particularly communicative, but it’s direct; there’s little lag between turning the wheel and the car following suit. There’s a bit of body roll during the emergency lane change, where the car darts from one lane to the next, but not enough to feel any loss of control. However, I’d expected the car to be more planted, as Subaru’s own literature cites reduced body roll as one of the main benefits of the boxer engine’s lower center of gravity. The Subie shines brightest on dirt roads, where its all-wheel-drive lets it claw around corners at speeds that would send most cars flying into the woods; not surprising, given the Impreza’s winning record in rally circles. If you do manage to break the tail loose coming around a turn, the stability control reels you back in – but it also has a way of messing up your intended line if you’re sliding on purpose. (Fortunately, the stability control can be turned off with a button hidden by the driver’s left knee.) Acceleration is adequate; Car and Driver ran the regular Impreza 5-door, which weighs 44 pounds less, from 0 to 60 in 8.4 seconds. 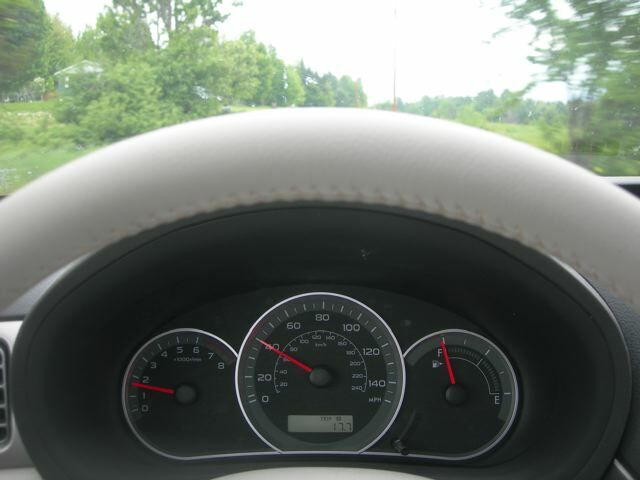 The engine can seem a little low on grunt at low revs, but things pick up past 2500 rpm. My tester, like all Outbacks, came in a two-tone paint job that plays up the long ridges of the body and makes it much easier to look at than the regular Impreza, even if it does seem to have a salt-and-pepper muzzle. And like all Outbacks, it came as a 5-door wagon. Well, calling it a wagon is being generous; no grown Labrador would be able to fit comfortably in the 19 cubic feet of space behind the rear seats (though it does come with a puppy-proof rubber mat for the cargo bay), especially given the way the rakish rear cuts into the space. 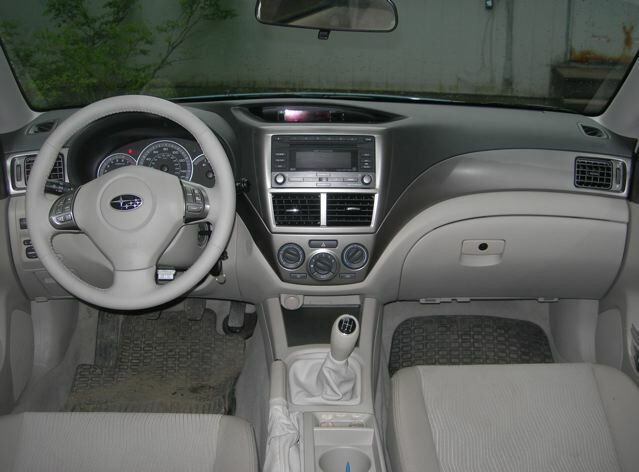 But aside from the smaller-than-ideal cargo area, the inside of the Outback Sport impresses. The two-tone treatment extends to the front seats, where the black dashboard segues through metallic-looking plastic trim into the beige interior. Controls fall right at hand and are easy to figure out, with the only exception being a few obfuscating buttons on the radio. (I’m pretty fluent in both acronym and L33T-speak, and I still have no idea what the hell the “PTY/CAT” button stands for. All in all, the Outback Sport proves itself a capable little car for its price range. While those who prefer their four-wheeled fun on paved roads may want to look elsewhere (or cough up the extra four grand for the WRX), the Sport promises to keep its driver safe, warm and comfortable no matter what the world outside may throw at it – not unlike Skipper.